Before starting an e-business project, you need to decide what it is that you will be selling. How will you monetize your online business? How will your site be monetized? There are other pay-per-click networks that share their revenue with website publishers and offer unique features. As your site grows in popularity you can start receiving requests for direct advertising. You can offer this at a rate you decide and can base this on advertising rates on similar sites. This is also referred to as affiliate marketing. The most popular affiliate program is Amazon.com Associates. Although they pioneered affiliate marketing, the are by no means the only affiliate program available. From flowers to travel, you can find an affiliate program for almost any niche and topic. There are also affiliate programs for selling digital products such as ClickBank. Affiliate marketing works best if you can add your own point of view and recommendations on products you will be promoting. Just like with get-paid-per-click advertising, you copy-and-paste code snippets of products. These snippets include your unique affiliate id so that if someone makes a purchase as a result of following a link from your website, you can credit a certain percentage of the sale. The advantage of affiliate marketing is that you can start selling right away after being approved (which can take 24hrs to a few business days). Also, you don’t need to stock inventory and don’t need to worry about delivery. Additionally, promoting affiliate products or services on your e-business site can also be a smart idea while you build your own inventory of products. Quality domain names are sought after as they are the backbone of online advertising and marketing. They can be registered at a very low cost (around $9-$20 per year) and resold at high profit. Generic domains can also be developed into niche portals. For example, if you own the domain BuyAlligatorBoots.com, you can develop it into a mini niche site selling alligator boots from Amazon or another affiliate. Or if you own DietNutritionPlans.com, you can sell nutrition books and e-books via Amazon.com, ClickBank, eBay, etc. Another example is say if you own TravelToToronto.com, you can sell Toronto travel books, maps, t-shirts, etc., from a quality affiliate program. You can mix and match products from different affiliates, as well as add your own articles and place advertising. If you can’t find a domain available in your topic, you can always browse domain aftermarkets and even contact directly a domain owner to see if they would negotiate a selling price. There really is no limit to how many generic domains you can register and develop. Do you make your own items (i.e. gifts, clothing, decorations, etc.)? Have you written a book or an e-book? Are you a musician and make your own music? Do you create anything that is tangible or can be downloaded? Then why not build your e-business around this? Selling your own products or services is more work but you get to keep 100% of the profits. A product can even be your expertise, as in consulting services. 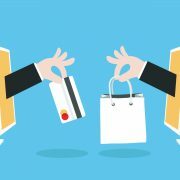 In most cases, you will need an e-commerce site that is capable of taking orders and payments, and you will be responsible for the delivery of any product or service ordered. What will you sell or promote? This may be a tough question to answer for some and very obvious to others. You may already know what your site will be about after reading the above sub-heading. If you are still wondering then here is a principle to bear in mind: keep a balance between your passion and others’ needs or wants. For example, if you are passionate about something that others need or want then there is an ideal subject for your e-business site. If you are not sure, then talk to some experienced friends or family. The most important thing is that you embark on something you will be motivated to stick with. The successful e-business entrepreneurs are the ones that endured the ups and downs, mostly downs, before they became successful. The Internet is not an overnight money-maker as some may have you believe. It takes work as in any business to succeed and learn from your mistakes. But the rewards can be well worth it. Online directory for businesses in your local area. You can visit personally the businesses and offer them a monthly or annual subscription to be promoted on your website. Start a blog on something you are interested in or know a lot about (i.e. photography, music, pets, art, movies, food, etc.) As your site grows, you can add advertising and affiliate links to start making money. Write a book or an e-book on a topic you know well and others can benefit from, then build a website to sell it and get paid. Some hot topics are: how to lose weight, cheap travel, promoting yourself to employers, do-it-yourself (from fixing your car or home, to self-care), etc.